AskJane@glutenfreedynasty.com to customize small, medium or large – breakfast, lunch or dinner! At Gluten Free Dynasty the answer to that question is everything! Gluten Free Dynasty carries only gluten free food products including gluten free pizza and the best gluten free food gift baskets for any occasion. Individuals who need to follow a gluten-free diet will be in heaven! Every day food, and only gluten free food, is what you will find on shelves and freezers in “every aisle” at Gluten Free Dynasty. Think pizza, pasta, cookies, brownies, pretzels, bagels, pie crusts, donuts, French bread, hot dog and hamburg rolls, and even Happy Birthday Cake! Imagine! Every day foods in supermarkets are now gluten free food products found exclusively at Gluten Free Dynasty in Pennsauken, NJ! Many gluten free products at our retail store (along with Water to Go) are also dairy free, soy free and nut free for those individuals who have challenges associated with a food allergy. In the U.S. about 1 out of 130 people has celiac disease. Celiac disease is an auto-immune disease that is not an allergy. Individuals cannot outgrow celiac disease. Children and adults with celiac disease must eat a gluten-free diet. Gluten is a protein filler (part of wheat, rye and barley) found in many products including ice cream cereal, soups, crackers, cookies, soy sauce and much more. Living Without magazine is a wonderful informational and product source to begin investigating how to eliminate “gluten” from your diet. Gluten Free Dynasty has many of these gluten free food brands on its shelves. If you are seeking a special gluten free product, Ask Jane and she will be happy to help you. April is National Autism Awareness month. A gluten-free diet has been associated with improving behaviorial symptoms associated with autistic spectrum disorders. Please go to this link to find more information on Autism New Jersey. Gluten Free Dynasty is located on Haddonfield-Berlin road, 1 ½ miles past the Cherry Hill Mall and just past the Pennsauken Country Club. The same building houses Water to Go providing purified water in large gallon containers or convenient travel size bottles. Customized water bottles are available for that special event (weddings, reunions) or customized with a company business logo. Local fitness centers can now purchase personalized water bottles and gluten free snacks at Gluten Free Dynasty. Combine mascarpone, ricotta, sugar and ¼ cup of the amaretto in a food processor or blender on high speed several minutes, until the mixture is completely smooth. Set aside. Line an 8-inch springform pan with plastic wrap. (Glad Press & Seal works really well.) Place a layer of ladyfingers, fitting them tightly in the bottom of the pan, using up ½ of the package. Combine the coffee and remaining ¼ cup amaretto. Pour half of the liquid evenly over the layer of ladyfingers. Cover with half of the cheese mixture. Use the remaining ladyfingers to cover the cheese in a light layer. Pour the remaining liquid over the ladyfingers and cover with the remaining cheese. Sift the cocoa powder to cover the tiramisu completely. Refrigerate for 6 to 7 hours or overnight before serving. (The longer you refrigerate the better.) 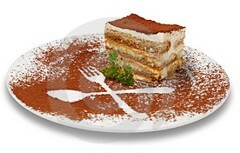 To serve, release and remove the sides of the springform pan, becing careful not to damage the tiramisu. Cut into 12 pie-shaped wedges. Visit Gluten Free Dynasty every month to check out new gluten free products, gluten-free diet information and gluten-free recipes. Gluten free gift baskets, for any occasion, including breakfast, lunch and dinner, are some of the favorite items at Gluten Free Dynasty. If you have a questions or a special request, please call Gluten Free Dynasty at 856-910-8881 or email AskJane@glutenfreedynasty.com.